This is another victory for the Kapamilya network since of the 10 stars who were able to be included in the list of YES Magazin’s 100 Most Beautiful Stars, 60 of them came from the said network. Sarah Geronimo, one of the Kapamilya stars topped the list. To know the details of the said ranking of celebrities, care to read the article below. 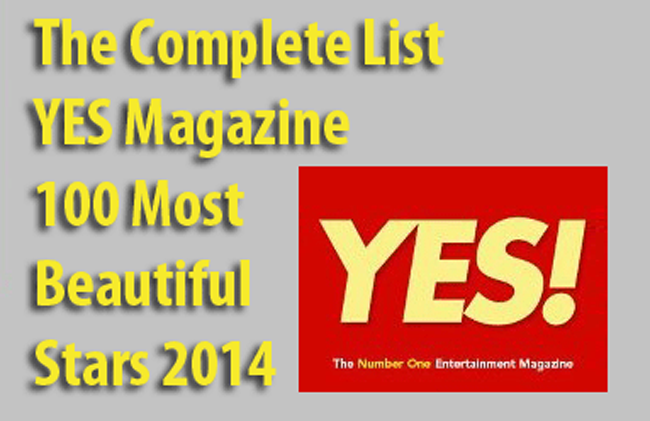 According to YES, they have spent time for the list since it has gone through evaluation, negotiation, etc. in order to become fair. The list is also personal according to editor-in-chief Jo-Ann Maglipon and it is not based on dislikes. It means to say that the list went through a lot of brainstorming so that the list would be released in such a way that it is reliable. Talking about some of the Kapamilya Stars who made it to the list, they are Julia Montes, Kathryn Bernardo, Daniel Padilla, Maja Salvador, Kris Aquino, Jodi Sta. Maria, Coco Martin and many more. ABS-CBN is a network capable of discovering good looking actors and actresses. With the several shows in the said network where the actors and actresses can work, this network is truly one of the best, and maybe the best. If you want to know the official list of the 100 Most Beautiful Stars, you can visit the official site of YES Magazine or read articles related to this. There are other actors and actresses included in the list from other networks but ABS-CBN has the most number of list. Congratulations to those who are included in the list. They have shown to the world how beautiful the Filipino race is. Congratulations also to Kapamilya Network for having the most number of actors and actresses on the list.